Image: Persons of Japanese ancestry from San Pedro, California, arrive at the Santa Anita Assembly center in Arcadia, California, in 1942. From the article linked below. Reblogging this to CoffeeShopRabbi.com. I want my readers to learn about this terrific blog, BarrioBoychick.wordpress.com. There is so much in the news about immigrants and “foreigners” I think this is a story we need to remember right now. May the day never come again when the United States commits itself to such a hateful program. This is a copy of the “The Siren,” published by Hollenbeck Middle School (Jr Rough Riders) students in December 1941. What should we notice about this page? 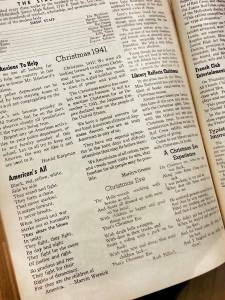 Christmas 1941! We are all looking forward to a joyous Christmas season, a time when all would be in a glad holiday mood, a time of peace and good will. This is interesting to read. I discussed the Japanese Internment with some of my students awhile back. This can never happen again.